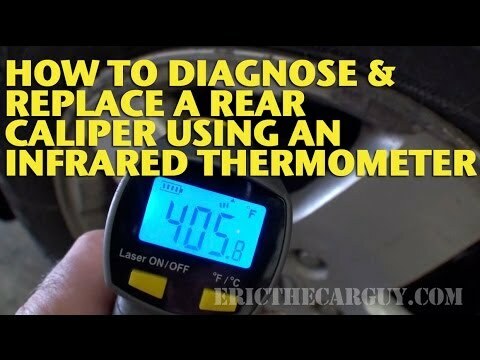 How To Diagnose and Replace a Rear Caliper Using an Infrared Thermometer shows how to use an infrared thermometer to find a bad caliper. This method will also work on front calipers as well. Earlier this year ScannerDanner was visiting the shop and after we came back from a drive in my 2004 Honda Element, we smelled overheated brakes. The smell seemed to be coming from the right rear caliper. Upon further investigation, using an infrared thermometer, I found that that caliper had seized up and needed to be replaced. I've done brake videos like this in the past but never went through this particular diagnostic procedure to figure out what the issue was. It's a method you can use for many other mechanical issues as temperature diagnosis is something that is used throughout the service and repair fields. It's a fast and easy alternative to taking things apart for diagnosis. I hope it's able to help you should you run into similar issues with your own vehicles.